The Cullen family has been hit hard by the flu. Normally we sail through the flu season with nary a sniffle nor sneeze but this year is different. I’ve heard that this strain of flu has been particularly bad throughout the country. Yesterday my son was diagnosed with pneumonia. His flu progressed that quickly. Of course this is the kid who rarely gets sick but when he does, watch out! He doesn’t get a cold, he gets pneumonia. He doesn’t get strep throat, he gets mono. So all of my plans to write are gone beneath the blanket I’ve been huddled under for two days. Sniffles. Cough. Oh, yeah. Fun times. People keep asking if we got the flu shot. Nope. Never had before, didn’t feel a need to now. I’m of the opinion that it’s best to use my body’s own immune system to protect itself. Will I get a flu shot next year? Probably not, but I might for my son who can’t seem to get an ordinary cold. What about you? Do you get a flu shot every year? This entry was posted in Life and tagged Flu, Flu shot, Pneumonia by Sharon Cullen. Bookmark the permalink. Hugs, Sharon. Glad you’re feeling well enough to blog. Because I worked in a hospital, we were pressured …uh, I mean encouraged … to get a flu shot. I always refused. 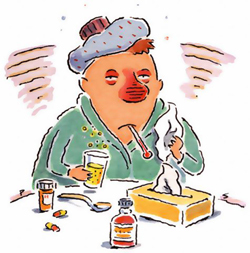 I never say never, but I don’t think I ever will, unless I’m so old and frail that a bout of flu will kill me. Then I suppose I’ll think about it. LOL I love the title of this post!! I don’t get a shot, but never really had the ‘flu until this Christmas and it was lousy. So I’ll think twice next year. Bless your son, I hope he recovers quickly and that your House of Germs turns into just a normal house again soon! Oh, dear…sending good health vibes your way, Sharon! We’re not flu shot people. I’ve had 1 in my entire life. I was sick more than winter than every before – walking pneumonia, strep throat, a flu that lasted 2 weeks. It was awful and there is a part of me that blames the flu shot because pre-shot I hadn’t even had a cold that year! I’ve heard this so many times Kristi. This is why I never get one. I’m not convinced that getting one this year would have saved me either. Sorry that your son is not doing so great. I’ve never gotten a flu shot. I’m afraid if I did, I’d get the flu from it. Sharon, you poor thing! Sending warmth thoughts your way. Like everyone else here, we never get a flu shot. Sharon, I’m sorry to hear this. Hope you all are better soon. But you should consider the flu shot. I won’t tell you the nasty stats…..
God, I wish I could get the flu shot!!!!!!! I’m allergic. Last time I tried to get one was in 2009 and came down with hives and an asthma attack… Luckily, I was in the allergist’s office doing a vaccine challenge to determine if I really am allergic or if the hives I’d gotten the last time I’d gotten one had been a fluke. So, they doped me up to keep me from having annaphlaxis (and no I’m not allergic to eggs). I really hoped I could have the shot, not only is it a condition of employment for me (I work in a medical clinic), I was scared to death of N1H1 (Swine Flu) when it came out in 09. But alas I couldn’t get the shot. And I got a nasty case of Swine Flu that nearly killed me.